In a mad swirl of sand tornadoes and time passing by, bloodthirsty armies invade and conquer, invade and conquer, leaving scorching paths of surrender and total destruction. Here, in the land of leeches, the dirty, dusty rot of resignation is born. It is a submissive acceptance in fate as divine ruler, a decrepit belief that we were never the gatekeepers of our own actions, and only mere extras in our own epic theater. But for what it may lack in human drama, this belief in foregone conclusions offers a welcome oasis for the tired and weary. It is here where calloused feet soak in pools of cool nirvana. It offers a place where we can sleep, even now, under the high sun of the early afternoon. An echo sounds (or so it seems), off in the distance, far away from the whispering palm tree breeze. What is this distant voice of dissent that stirs? Perhaps it is only a feeling, lost deep inside in a ravaged gut. Maybe it is only the vacant wind. And yet, despite its cloak of invisibility, all is locked in anticipation. It is the heartbeat of a warrior, unwilling to surrender. 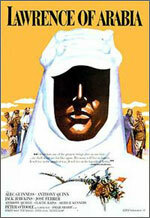 T. E. Lawrence (Peter O’Toole): Nothing is written. At first, it is merely a dot on the unreliable horizon. Or is it the sleight of hand of false hope with weary eyes playing their torturous tricks? But then it grows. A shape. Larger still. A definite shape! Your legs, which had been open wide in an embrace of inextinguishable pain, are now weightless with time standing perfectly still akin to surreal bliss at the moment of birth. A resurrection of belief rises. Mr. Dryden (Claude Rains): Big things have small beginnings, sir. A mind in the desert is a powerful thing. It can inseminate, however foolishly, a belief that miracles can happen, or a belief that one man can make a difference. Attempts to dismiss it as the conviction of youth cannot halt its momentum. It continues to build, however slowly, this belief that we can achieve the unachievable, reach the unreachable, that we will enter the gates triumphantly, together in a mythical Land of One. But danger is never far away. Make no mistake; it is hidden inside the Achilles heel that accompanies greatness. The danger of insufferable vanity injects a most lethal venom. In order to believe in one’s ability to move mountains, one must also possess an inherent inability to recognize the line between fortitude and foolishness. The engraver of epitaphs is summoned. Lawrence: Do you think I’m just anyone? Do you? It can be said that the only true failure is failing to try at all. But is that really so? Such a belief suggests that there is a brand of defeat that is okay. The right answers remain as elusive as truth itself and we mere mortals are left to gaze into the vast emptiness of poker-eyed stares emanating from those who dare to dream at all. William Potter (Harry Fowler): What’s the trick then?